Black Sword Aikido is not just another fighting art. The world has more than enough methods of destruction and does not need another. Black Sword Aikido is a martial discipline for strengthening the body, mind and spirit and for discovering one's true will and purpose in the scheme of things. As such, it requires not only the practice of fighting techniques, but also meditation, breath control and the study of oriental medicine and philosophy. With the skills and knowledge gained from training in Black Sword Aikido, one is expected to go out into society, fulfill one's true will, and protect humanity. Black Sword Aikido techniques consist of joint locks, throws, pins, and strikes to the body's vulnerable points. Techniques also include the use of, and defense against, various weapons, including the sword, staff, and knife. 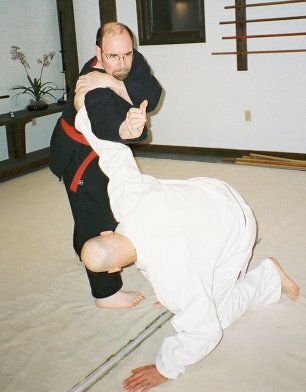 In that Black Sword Aikido teaches many pain/compliance techniques, the student must be willing to accept some pain to learn the art. Because the emphasis is on the use of strategy, position, and leverage not strength, Black Sword Aikido techniques can be effectively practiced by men and woman of all ages.